Level Field: Qatar sound early warning! 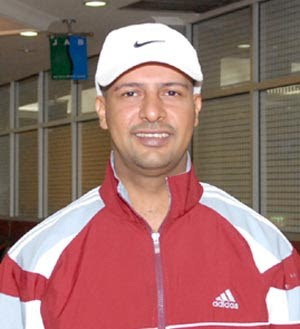 Qatar's coach Khalifah Al Kubaisi sounded an early warning that his protege Mubarak Al Muraikhai is here to win the 45th QubicaAMF Bowling World Cup title in Melaka. They certainly are serious, for they were among the “early birds” to arrive in Melaka on Monday. Khalifah a former bowler himself and who is very familiar with Malaysia, said that he has bowled in many tournaments in Malaysia and in different centres, but thinks that the Melaka International Bowling Centre (MIBC) is the best he has seen in Malaysia. “This is a very beautiful centre with the latest equipment and is unique. Mubarak is all excited about the centre and wants to make a memorable outing here by winning the title,” said Khalifah (below). Mubarak, who turns 35 on Dec 14, nodded in agreement. “Indeed this is a wonderful centre and I simply love it. I have been practicing here for four days now and although the actual oil patterns have yet to be laid, I am very comfortable and looking to reach the final,” said Mubarak (below) who is ranked the top bowler in Qatar. “We have come all this way and certainly are not looking at anything but reaching the final. Yes, I am aware that there is a strong field, but if we do not have the ambition to win the title, why come here,” asked Khalifah. Mubarak who has an average of 214, has a string of achievements which include the bronze medal in the All-Events and silver in the Masters in the World Youth championships in 1998, silver medal in the Masters in the 2002 Busan Asian Games, said that he would be disappointed if he does not make the final. “I am not being arrogant, but I am just determined to do well here,” said Mubarak who was a member of the team who won the silver medal in 2008 Asian Bowling championship. 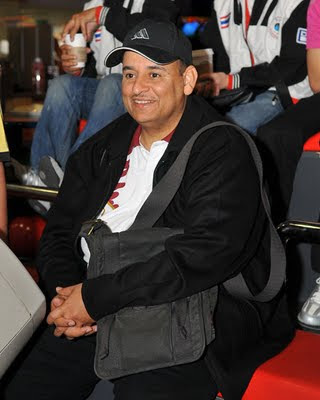 For the record, Qatar have won the Bowling World Cup title twice – in 1989 in Dublin when Salem Al-Monsouri won it and in 1999 in Las Vegas by Ahmed Shaheen. Coincidentally, Qatar has won the last two titles in intervals of ten years. This year being 2009, is ten years since Qatar last won and probably that is the reason Khaliffah and Mubarak are confident that they are going to wrest the title again. Even the presence of PBA bowler Walter Ray Williams Jr with 45 titles to his name, Canada’s Michael Schmidt who won in 2005 in Ljubljana and other notable bowlers like Paul Trotter of Australia, Ryan Leonard Lalisang, Petter Hansen from Norway, Martin Larsen from Sweden and Malaysia's Zulmazran Zulkifli, does not seem to bother Mubarak. Time will definitely tell, but it is certainly an early warning to other bowlers to keep an eye on Mubarak.